Now You “Sea” Ice, Now You Don’t by: Juanita Constible, Luke Sandro, and Richard E. Lee, Jr.
Increasing air temperatures in the last 50 years have dramatically altered the Antarctic Peninsula ecosystem. In this interdisciplinary inquiry, learners use a cooperative approach to investigate changes in the living and nonliving resources of the Peninsula. The activity stresses the importance of evidence in the formulation of scientific explanations. 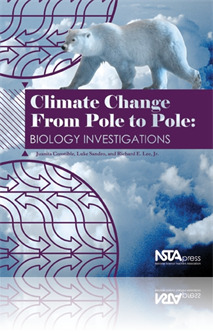 This free selection includes the Table of Contents and the following sections: How To Use This Book; Climate Change Case Studies (Chapters 5—10): Their focus, use, and Curriculum Connections, and About the Authors. As a special bonus, Chapter 1, entitled Climate and Life, is also included. This could be modified rather easily for a middle school classroom. Students could look at data, make graphs, and be asked more guiding questions to connect the effects of rising temperatures. The effect is similar to a cascade throughout the environment. This book chapter was extremely helpful for providing examples of Global Climate Change for my students. I liked the introduction for Global Climate Change and a good use of real life examples for further understanding. There are actually two chapters here - Chapter 1: Climate Basics introduces a lot of information in a relatively short chapter - if this is new to you then you will want to take notes or make a dictionary but it is comprehensive! The second chapter is the one named and is a student jigsaw where groups analyze data on biotic and abiotic factors that influence the Adelie penguin community. The links all work and in addition to the mentioned extensions, I would have students diagram the systems being explored (like a water cycle diagram but for the communities mentioned) and discuss positive and negative feedback loops, especially in upper middle or high school classes. This could also be used in an undergraduate survey environmental science class.